Groups of 10 or more receive a 10% discount. Use discount code ACCGROUP. Please NOTE that 6 and under free tickets cannot be included toward the group discount. Tickets Now On Sale - We Will See You There! 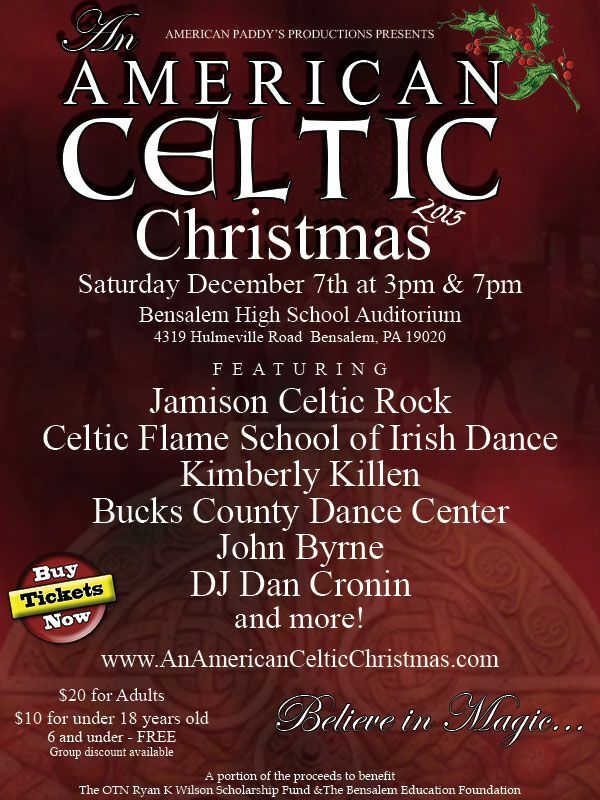 American Paddy's Productions is excited to announce 'An American Celtic Christmas 2013' to be held on Saturday, December 7th at the Bensalem High School auditorium. With 2 performances taking place at 3pm and 7pm, An American Celtic Christmas combines live music with traditional Irish, Hip-Hop and Celtic Rock Dance. Over 100 performers will take part in the show including Jamison Celtic Rock, Celtic Flame School of Irish Dance, Bucks County Dance Center, singer Kimberly Killen, John Byrne, DJ Dan Cronin and more. Called 'The biggest Celtic Christmas show in Philadelphia' last year, this is an experience not to miss for the entire family! Groups of 10 or more receive a 10% discount. Use discount code ACCGROUP. Please NOTE that 6 and under free tickets cannot be included toward the group discount. Producers of the Philadelphia Fleadh, An American Celtic Christmas, Paddypalooza, and The Samhain Halloween Ball. American Paddy's is run by members of the band Jamison Celtic Rock and works to promote unity in the Irish community and support all facets of the culture. This event is organized by American Paddy's, LLC.